Halifax, Nova Scotia is not only the province's capital, but also one of the world's largest natural harbours, situated on the south Atlantic shore. This romantic place, never far from the water, offers an exciting mix of history and the present combined with a metropolitan flair. Halifax is the largest city east of Montreal and boasts a variety of musical and cultural entertainment, galleries and museums, as well as historic sites. Halifax is well known for its friendly hospitality, and many site seeing attractions for visitors to the city and surrounding area. During the summer months the Waterfront attracts tourists and locals alike, taking in the beautiful ocean scenery, boats in the harbour, Historic Properties with small shops and eateries, the Museum of Natural History which houses the Titanic exhibits. Further up from the waterfront, you'll find Citadel Hill, the Commons, the bustling Spring Garden Road area, Public Gardens, Point Pleasant Park, all within walking distance of each other. Dartmouth is situated on the eastern side of Halifax Harbour in the Halifax Regional Municipality. Dartmouth is also known as the "City of Lakes" as its 23 lakes provide great opportunities for kayaking, windsurfing, canoeing, and swimming. Dartmouth is popular with nature lovers, cyclists, walkers and paddlers alike. Unspoiled nature, parks, walking trails, and the Shubenacadie Canal - a course of lakes and locks - create a recreational paradise close to the city centre. Visit the Bedford Institute of Oceanography, a world-renown research facility, the Peace Pavilion with displays of countries around the world or Christ Church, Dartmouth's oldest church. Bedford is located at the head of Bedford Basin, between Halifax and Dartmouth. At first it was called Sackville but changed its name, when the Nova Scotia Railway built a station in the area in 1856. The community was named in honour of John Russell, fourth duke of Bedford (1710-71), who was secretary of state for the colonies when Halifax was founded in 1749. Today Bedford is popular for its artist's studios, restaurants, and many unique shops and businesses. Halifax is the largest city in Atlantic Canada. The Halifax Regional Municipality has a total size of 5,577.26 square kilometres. The Halifax Regional Municipality offers over 400km of coastline. Halifax is 2 hours closer to Europe by air than New York City, USA. The Halifax Metro Area has a population of 356,000, which is indeed about one third of Nova Scotia's population. Halifax is on the same latitude as Bordeaux, France and South Oregon. Halifax Citadel is Canada's most visited National Historic Site. Peggy's Cove is the world's most photographed fishing village and has the only post office in Canada located in a lighthouse. Halifax is home to 5 Yacht Clubs and 7 ocean beaches. 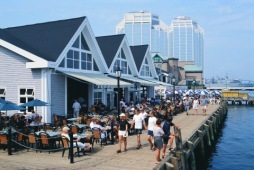 Halifax enjoys a mild climate in winter and cool summers. Average summer temperature is 16-24 C Average winter temperature is -3 C.
Halifax is known as "City of Trees". The most common way to come from Europe to Halifax is by air. The Halifax International Airport provides service to many destinations in North America and Europe. Halifax International Airport is situated approx. 35 kilometres (21 mi) from Downtown Halifax. You can access the airport by Highway 102. For more information visit the Halifax International Airport website. Train service is provided by VIA Rail. The station is located in the south end of Halifax. For more information visit the VIA Rail website. The individual traveller will arrive by car. Many highways will take you to Halifax. There is Highway 102 connecting the north with Halifax. From the east take Highway 7. Highway 103 takes you there from the southwest of Nova Scotia. Cruise and ferry service is available. Metro Transit operates a full bus and ferry schedule within the Greater Halifax area. For route and schedule details call Metro Info at (902) 490-6600, TDD at (902) 490-6645. Route maps and schedules are available at Visitor Information Centres and shopping mall information kiosks. For more information visit the Metro Transit website. A note to drivers: There are two toll bridges in Halifax/Dartmouth, the A. Murray MacKay Bridge and the Angus L. Macdonald Bridge. Toll required for a single crossing (one direction) is 75¢ or a token. The Macdonald bridge connects downtown Dartmouth to downtown Halifax and is the only bridge with pedestrian and bicycle access. The Provincial Park is just minutes away from the city of Halifax and offers an ideal getaway from the city's hustle and bustle. Recreational activities include hiking, swimming, boating, kayaking and camping. Approx. 23 kilometres east of Dartmouth the park is a natural heaven just outside of the metropolitan life. The lake offers opportunities for boating, canoeing, fishing, camping, and swimming alike. This wildlife paradise 40 minutes from Downtown Halifax showcases native and exotic species at its best. It is a popular family destination with interactive displays and photographic exhibits. Large picnic areas and a playground is provided. The Shubie Canal Park is located at 54 Locks Road in north Dartmouth and offers walking trails along the canal. The canal, that is popular with canoeists connects Dartmouth with the Bay of Fundy and has been built in the mid-1800s. This 17-acre park is located on the corner of Spring Garden Road and South Park Street in the heart of Halifax. It is a rare example of a formal Victorian city park, filled with floral displays, mature trees, statues and fountains. The park is open spring to late fall. This 75-hectare park is located at Point Pleasant Drive in the southern end of Halifax. Popular with sunbathers and joggers alike the park offers extensive walking paths along the coast and through the forests, picnic spots, a beach and the ruins of several fortresses. Motor vehicles are prohibited. The park still belongs to the British Government, that has rented it out to Halifax for 1 shilling (about 10 cents) a year, with a 999-year lease. The park is open year-round. 23 individual lakes within the city of Dartmouth form a recreational haven for swimming, water-skiing, cross-country skiing, fishing, boating and sailing. The lakes range in size from 1 to 140 ha, with the principal lakes of Banook Lake, Micmac Lake, and Charles Lake. Lake Banook is the site of many regional, national and international competitive paddling events. 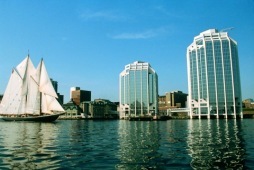 Halifax boasts a wide variety of fascinating historic properties, that date back until 1749, when Halifax was founded. Many of the restored buildings were used in the original settlement of Halifax and can now be toured by tourists. Halifax's vividness and culture are centred on its waterfront. By day, you may walk along the water or shop in nearby boutiques. At night lovers stroll beside the water, enjoying this romantic place. Pubs and restaurants invite you taking a seat to end the day with a fine meal or a drink with friends. The Halifax Citadel is one of Canada's most visited historic sites and has been the city's towering landmark ever since its construction in 1749, when Halifax was founded. Today's fort is actually the fourth fortification built on the site. Construction began in September 1828 and took almost 30 years to be completed. The fort was an important military base and the main reason, why Halifax was never attacked. In 1956 the site was declared a national historic park. Today guided tours will show you living quarters, powder magazines, and musketry galleries in the ditch, which brings alive the old days. At noon you will experience the firing of the noon-day gun, which is a Halifax tradition dating from the late 1800s. The Army Museum, located in the Cavalier Building, showcases an extensive collection of Atlantic Canada's military history. 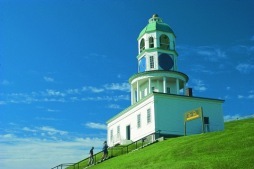 The Citadel Hill offers some fascinating views and is popular as a park and place to sunbathe. The Historic Properties are located on Halifax's waterfront and represent Canada's oldest surviving group of waterfront warehouses. The restored buildings dating back from 1800 to 1905 now offer unique specialty shops and boutiques, excellent restaurants and bars, boardwalk and entertainment. The Historic Properties are located at 1869 Upper Water Street and are open year-round. The Bluenose II, a replica of the original Bluenose schooner, is docked at the wharf of the Maritime Museum at Lower Water Street, when not on tour. Bluenose II is Nova Scotia's sailing ambassador and is Canada's best known boat. Originally build in 1921 at Lunenburg the Bluenose has become nearly as familiar a Canadian symbol as the maple leaf as it is even depicted on the Canadian dime. The Bluenose II was launched in 1963 and offers now 2-hour harbour sailing tours. When docked, you can tour this wonderful boat. For more information call (902) 634-1963 or call toll-free 1-800-763-1963. This impressive museum is located on 1674 Lower Water St. and showcases maritime history at its best. Many of the boats you can tour, which indeed makes it a realistic experience. Besides exhibitions on Days of Sail, the Age of Steam and many others there is a display on the Titanic and the Halifax Explosion. The museum also displays Canada's first hydrographic vessel, CSS Acadia. The facility is open year-round. For more information call (902) 424-7490. Pier 21 is located at 1055 Marginal Road and marks one of Canada's newest National Historic Sites. As Canada's last remaining immigration shed it displays immigration history of more than a million immigrants, war brides, and evacuee children. This innovative interpretive centre shows interactive displays as well as many photographs. Pier 21 is open year round. For more information call (902) 425-7770. The Keith's Brewery is situated on Lower Water Street is a massive ironstone and granite building, where Alexander Keith's beer was originally brewed. The building dates back to the 1800s and consists out the old brew house, hospitality rooms, 19th-century company store and an interpretive centre. The building is open year-round. For more information call (902) 455-1474. Province House is situated at 1726 Hollis Street and marks Canada's oldest provincial legislature since 1819. It is not only a National Historic Site, but the seat of the Nova Scotia Government and an excellent example of Georgian architecture. The facilities are open year-round. Free guided tours are available. The provincial art gallery is located in 1723 Hollis Street. The modern gallery resides in an restored heritage building of 1868 and showcases Canadian and international art in permanent and temporary exhibitions. The gallery is open year-round. The gallery, that is owned and operated by the Micmac people is located at the Halifax International Airport, Departure level. The gallery exhibits and sells a range of traditional and contemporary work by Native craftspeople and artists. Product line includes baskets, footwear, dream catchers, jewellery, wooden flowers, dolls, clothing, quillboxes, paintings, etc. Bedford Institute of Oceanography is located just outside of Dartmouth. Take the Shannon Park exit, at the Dartmouth end of MacKay Bridge. This is Canada's leading marine research centre and one of the world's largest oceanographic establishments. Exhibits show the institute's research in fisheries, oceanography and hydrography. The institute is open year-round. Self-guided tours take about 45 minutes. This unique pavilion is located at Dartmouth Waterfront and is a collection from countries around the world who contributed rocks and bricks from their most cherished historical sites or representing their proudest achievements. Among many others you will find pieces of the Berlin Wall and the Great Wall of China. The pavilion is open year-round. Christ Church, Dartmouth's oldest church is located on Ochterloney St. It was built in 1817 and exemplifies Georgian architectural design. Open Jun 1 to Sep 1. Halifax has the oldest history of all Canadian cities. History begins with "Chebucto" which means "the biggest harbour" in the Mi'kmaq language. Mi'kmaq Indians were the first settlers in the area. The French were the first Europeans to arrive in 1711. However, there was no settlement before the early 18th century, when both, the English and French fully understood the value of Chebucto, especially for the cod fishery. Colonel Edward Cornwallis accompanied by some 2,500 settlers from England arrived on June 21, 1749 aboard the Sphinx to found a new fortified town - today known as Halifax. Dartmouth was founded one year later in 1750, when German Protestants arrived to boost population. The town played an important military role and was used as a British naval base. Although it has seen many wars, Halifax has never been attacked due to the strength of the Halifax Citadel. Halifax's worst day ever was December 6, 1917, when the Halifax Explosion levelled parts of the city. In the early morning the Belgian vessel Imo collided with the French munitions carrier Mont Blanc in the Halifax Harbour, due to human error and negligence. A fire caused by the collision later ignited 2,766 t of picric acid, TNT and guncotton, which indeed was the world's greatest man-made explosion prior to Hiroshima. The blast was shattered windows in Truro, some 100 km away and was heard in Prince Edward Island. More than 1,600 people out of a population of less than 50,000 were killed. 1,600 buildings were destroyed and 12,000 damaged. On April 1, 1996 Halifax was amalgamated with neighbouring communities to form the Halifax Regional Municipality, but its individual identity has been retained.